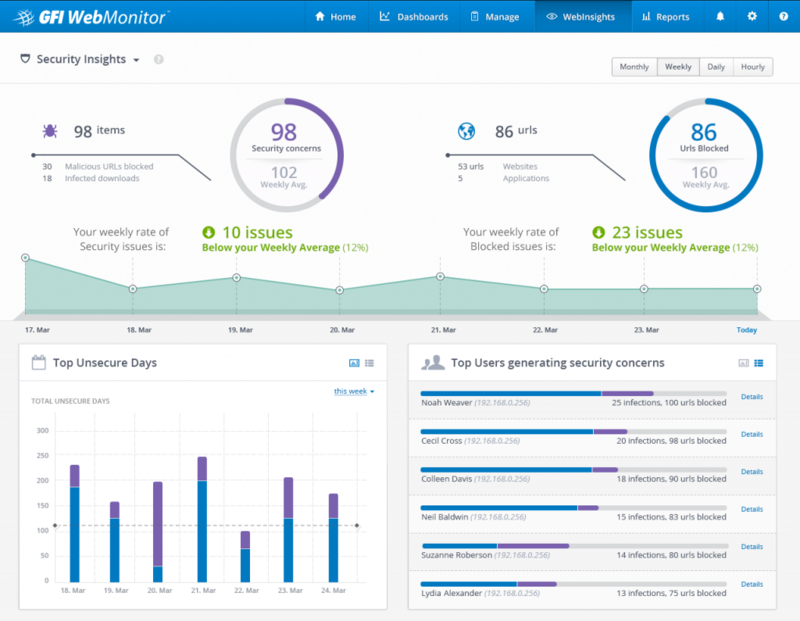 On March 26, GFI released a new version of GFI WebMonitor. What is interesting about this release is that it comes equipped with a new feature – WebInsights. WebInsights brings with it a new dawn of intelligent web-activity monitoring. From now on, IT admins will be equipped with unique insights of their company’s web activity and armed with tools to make sure they get any abnormalities or network abuse under control immediately thanks to real time monitoring. 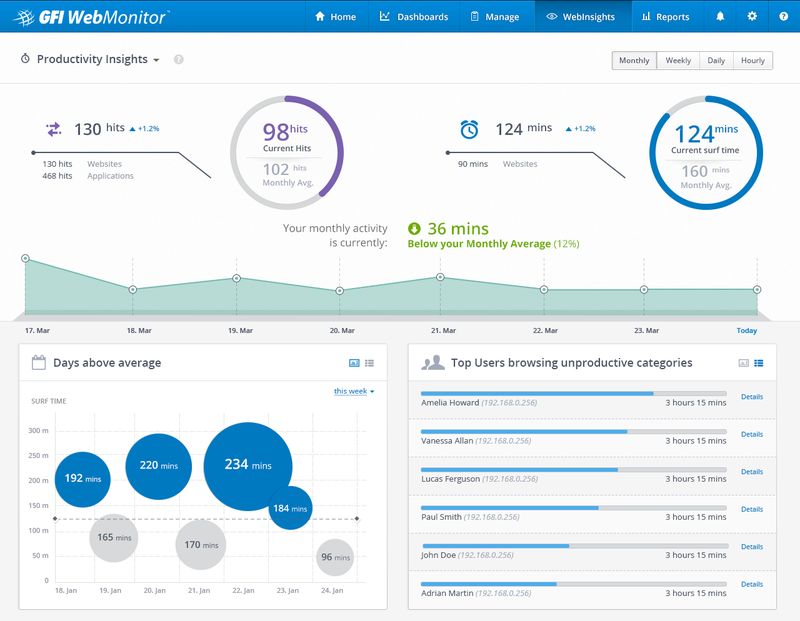 WebInsights collects historical data of your business’ web-activity. It then creates a baseline to which it will compare current data in order to help you make informed decisions. In essence, WebInsights is able to understand what the numbers mean and help you choose which actions to take. What kind of information does WebInsights provide? 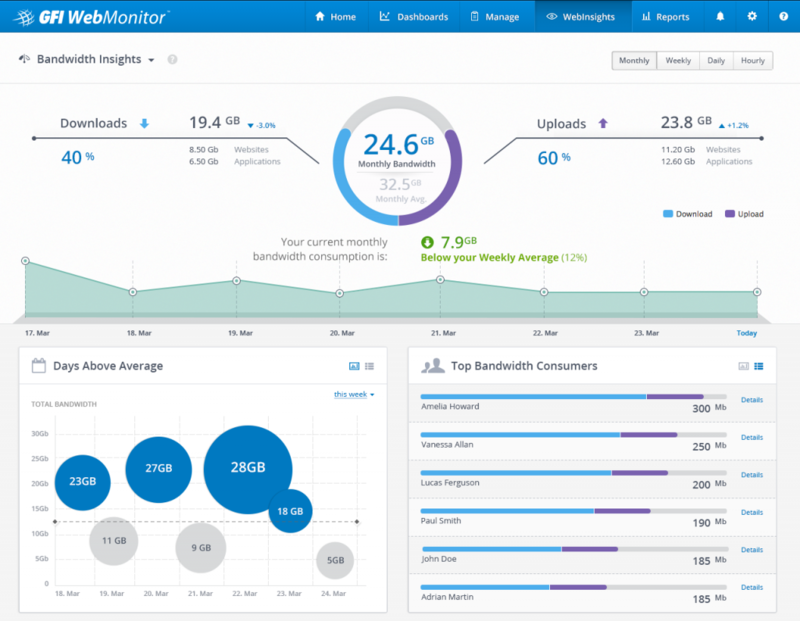 WebInsights informs the user on three main areas of interest: bandwidth consumption, security concerns and potential productivity loss areas. Thanks to the historical data collected, WebInsights can then present a set of analytics and compare to either an hourly, daily, weekly or monthly baseline. How is this data presented? Today you have consumed ‘x’GB of data and there were ‘x’ security concerns identified. You are ‘x’% below (or above) your daily (or hourly/weekly/monthly) average, here are the peak hours (or days/weeks) and the top contributing users. At first glance an IT admin will immediately know where they stand but that’s not all. 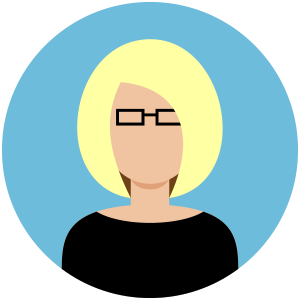 The IT admin now has the ability to continue drilling down through the data to identify any abnormalities specifically via user or website. They can then either enforce new quotas on the user or restrict access. Many of the security related peaks are normally generated by malware operating at endpoint level. Knowing which machine is responsible in just a few clicks can save precious time and assist an IT admin in mitigating risks and stopping security threats escalations. From the first look at the bandwidth consumption dashboard you will have a complete picture of what is going on with bandwidth usage. Data is split between downloads and uploads and once again split according to the source traffic (websites vs applications). It is then compared to the monthly/weekly/daily/hourly average. From this dashboard, you will also have a glimpse of the bandwidth hoggers on your network with an option to continue drilling down for more details on each specific user. Many companies allow their employees to do a little bit of internet surfing throughout the day as long as this does not interfere with work productivity. This dashboard is specifically to monitor what kind of websites or applications are being used unproductively and by who. Similar to the bandwidth consumption dashboard the productivity dashboard will also give you a list of users browsing unproductive categories with an option to expand on each one of them. Malware connects to dubious web servers to perform actions and uses the internet to replicate. Ransomware connects to C&C servers to get or set encryption keys, which are then used to encrypt the victim’s files. The security concerns dashboard will immediately highlight such a security risk. If for an environment 100 malicious URLs blocked per day is a normal occurrence, having 100 in 10 minutes is not and this is where WebInsights is essential as it can be used as more of a preventative tool. One click drill down into the peak will show the source IP and in turn this is where the IT admin is very likely to find malware. 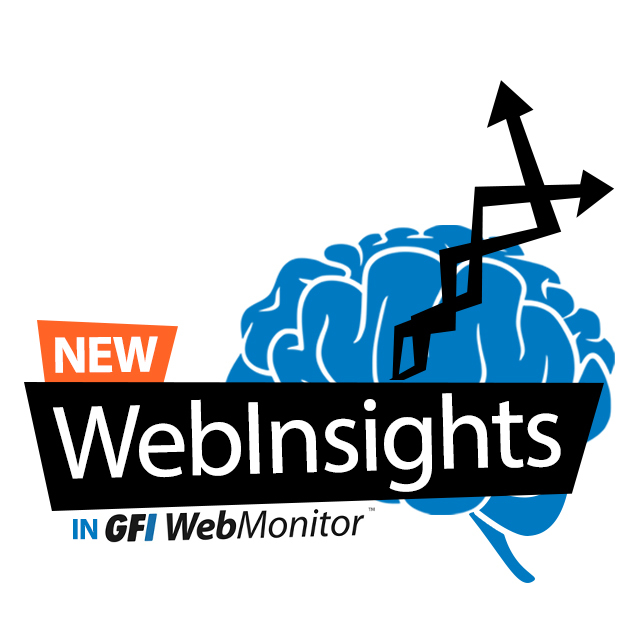 There is so much more to discover in the newly launched GFI WebMonitor and so many other tools that can help your IT section achieve better results in the fraction of the time. 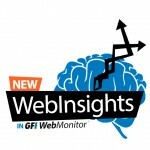 Click here to learn more or to test drive GFI WebMonitor yourself by downloading a free trial. How well does this tool manage/track individual usage on Remote Desktop servers? If you have 30-40 users connecting via thin clients, can you still get granularity? Hi Joe! In case multiple users are connecting from the same IP, in order to maintain granularity, you need to enable authentication. Thus each user authenticates and policies can be applied on a per user basis, irrespective of where the user comes from – of course traffic must pass through WebMonitor. GFI WebMonitor supports basic proxy authentication and integrated authentication. You can download a free 30 day trial if you would like to try it out by clicking here.